I've been toying with the idea of building a test rig to see how differently the two behave. As part of that thought process I've been work out how the CDL changes the way is distributed power to the wheels, and what influence that might have on the ETC programming. One of the problems (for me at least) is that without an understanding of the physics of diffs it’s almost impossible to make sense of what is going on. One of the most BS free and straight forward pages covering the diff behaviour is Your differential and μ . The μ is the symbol of the traction coefficient and the article looks at how much force can be applied through each wheel. It's well worth a read, in fact I'd suggest reading the article before continuing on. - output with lowest tractive force sets the maximum torque applied to all outputs. Anyway, lets look at this from the perspective of a Discovery with open diffs, unlocked centre diff and no ETC. The plots are created using a basic model of the D2 drive train in Simscape Driveline. The main idea is look at the general behaviour that specific values. Driving on tarmac there is no problem all wheels have high friction connection through the tyres to the road surface so torque and power splits 25% to each wheel. 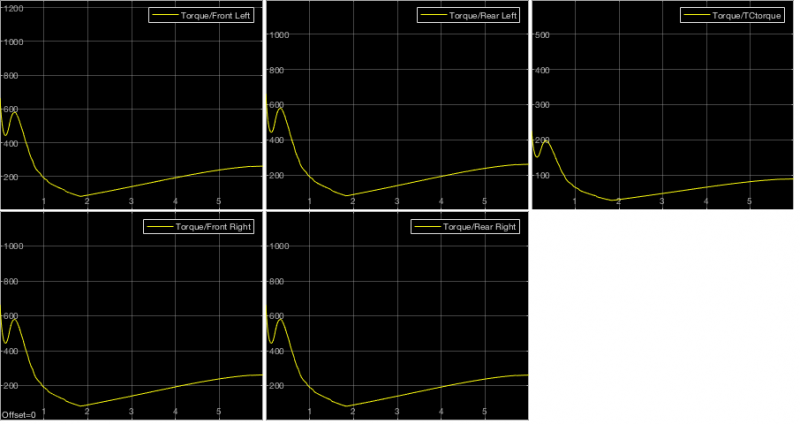 You can see this behaviour in the plots below where the torque and wheel speed is close to identical for all four wheels. Note that the gear reduction of the transfer case and front and rear diffs multiplies torque and divides rpm by the overall gear ratio. Next the tarmac conditions are modified so that one rear wheel behaves as if it is on a surface with less resistance than ice. I was running into problems with engine rpm going over 6000rpm in less than 2 seconds with a wheel in the sim, so this is an almost no traction alternative. Notice that the speed of the wheel with minimal traction spikes to over 500rpm, while the wheels with traction are below 25rpm. The torque output per wheel is significantly lower and all wheels have the same torque output which confirms the observation that the wheel with lowest traction sets the maximum torque output for all wheels. This is an interesting case - two wheels on the rear axle have essentially no traction. Both wheels have the same surface parameters so both slip at the same time and spin to the same speed. Torque is low - about the same as with a single wheel with no traction. For ETC to be effective in this situation both wheels on the same axle need to be braked simultaneously to redirect power to the wheels with traction. So what happens when the CDL is locked? The result is slightly surprising - despite the lack of traction the rear wheels are moving at the same speed as the front wheels. At first glance this seems a bit odd, but consider that the locked CDL means the input to the rear diff must rotate at the same speed as the input of the front diff. Further, the average speed of the left and right outputs is the same as the input speed. If the level of (non)traction is same on both rear wheels they will rotate at the same speed - which means the speed of the front wheels. The big difference is in how torque is distributed. Open diffs always split torque 50:50, while a locked diff can distribute torque 0:100. So in the case of the locked centre diff and open axle diffs if one wheel on one axle has no traction the other axle can use all available torque up to the limits of traction. And this is exactly what the simulation shows occurring. The problem with HDC seems to be that it looks pretty simple - put the TC in low and push the HDC button and off you go... The HDC will certainly operate this way but it's not necessarily going to be particularly effective!! If you read the documentation covering HDC it becomes apparent that one of the factors driving it's adoption was the removal of the user lockable Centre Diff Lock. The concern was that loss of traction on a single wheel would render engine braking ineffective leading to loss of control of the vehicle. There are a couple of other safety concerns, such as neutral being selected - possibly due to gear lever being knocked out of gear during a rough descent? All these concerns underscore the key point that HDC is intended to assist when engine braking alone is insufficient to control vehicle speed. The premise therefore seems to be that HDC is a safety net which works in conjunction with engine braking rather than a replacement for engine braking. The Owners manual provides operating instructions for the HDC that are basic at best. HDC can be engaged in high or low range but only operates in Low Range. The green HDC light illuminates solid in Low, and flashes in High. Vehicle must be travelling at less than 50kmh/31mph. In the Driving Techniques sub-section of the Off-Road Driving section, the Descending steep slopes page contains additional information on how to use rather than simply enable HDC. Stop at least one vehicle length before the slope. Select 1st gear / D1. Engage HDC (ie press button). Unless necessary to stop do not touch brakes or clutch. The manual also notes that if the vehicle begins to slide HDC will accelerate the vehicle to maintain directional stability, but will automatically slow the vehicle as soon as possible. Refering to Tom Sheppard's The Land Rover Experience book (1994 edition), it's interesting to note that the HDC behaviour apparently matches the recommended driver action in the these circumstances. Sheppard notes that If the ground is too slippery to provide the grip for the retardation of the throttle-off engine and you begin to slide, be ready to use the accelerator to help the wheels 'catch up' with the vehicle and eliminate any wheel slide. He also comments that There may be occasions - typically long descents of loose ground or extremely slippery clay, steep initially - where low range 2nd gear will be better in order to preclude an initial sliding-wheel glissade. My guess is that the claims that HDC "runs away" are based incidents where the Disco has started sliding due to loss of traction and HDC has accelerated in a attempt to regain control. What the manual doesn’t mention is that with 0% throttle the Auto will lock the torque convertor in 1 and 2 when revs exceed a specific value. 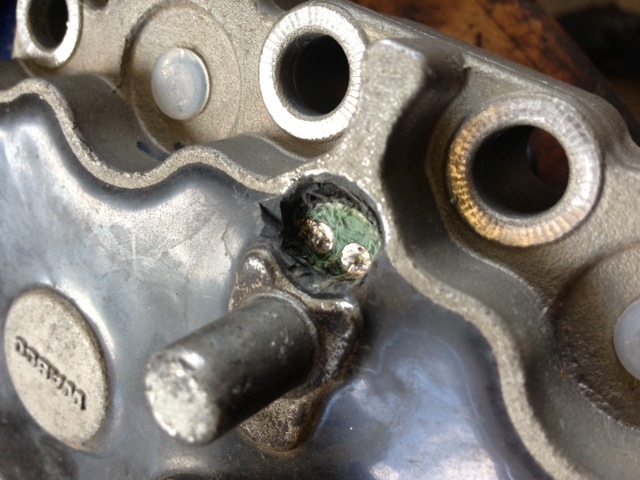 From testing I did a few years ago with a Nanocom 1 while watching the TC lockup (solenoid 3) it appears the lockup occurs at around 2000 rpm, and the Torque Convertor unlocks again when revs drop below this point. An AULRO user who is a big fan of this function says that it occurs at 1800 rpm and stays locked for much longer periods. As the Auto takes into consideration rpm, throttle, roadspeed and current engine torque plus preprogrammed shift maps so it’s quite possible that both data points are correct depending on conditions. The low range, 1 or 2, 0% throttle lockup seems to correlate with a road speed slightly higher than the minimum target speed of the HDC. Even without the use of HDC this 0% throttle lockup noticably “pulls back” the speed. If you keep an eye on the Tacho you’ll see the revs spike when the lockup engages then drop back. One of keys to understanding HDC is the concept of target speed. This is only mentioned in passing in the Owners manual but is well documented in RAVE and the New Discovery Technical Briefing pdfs. The minimum target speed depends on the transmission type, gear selected, and the terrain being traversed. If the terrain is very rough, very slippery, or the vehicle is negotiating tight corners a “Reduced” mode of operation is triggered which lowers the minimum target speed. The table below gives the minimum speeds in kilometers per hour. 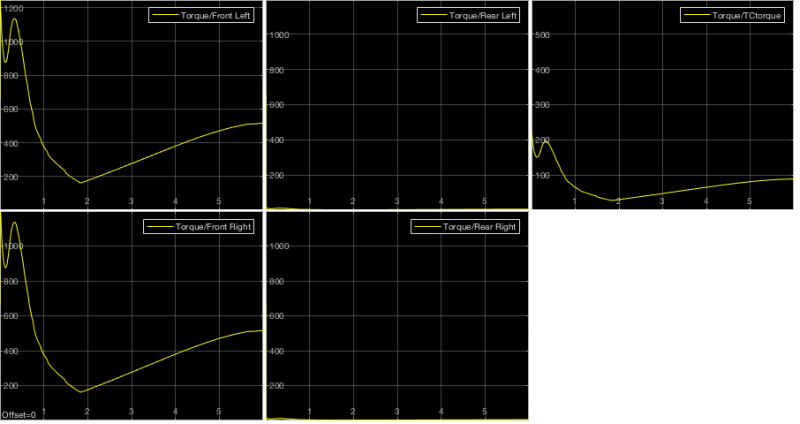 These minimum target speeds are used when the throttle input is 0%. Below the mimimim target speeds engine braking is used to control speed. The target speed can be raised to a maximum of 50kmh by applying throttle. For example, if you are driving down a hill using HDC and the gradient eases you can increase the speed the HDC activates by pressing the accelerator. The HDC is designed in such a way that you can leave it enabled and drive on the throttle only. It's something that works quite well on the Auto, but I'd imagine that it might not be so much fun when changing gears using a manual! If you give it a try you'll find that HDC applies brakes very gently when the road speed relatively high - as the road speed gets closer to mimimim target speed the application of brakes gets far more aggressive.